8-1/2", 9-3/4", 10-3/4" & 12"
Donabe is a Japanese casserole dish used to cook a variety of one pot dishes such as yosenabe, nabeyaki udon, sukiyaki and oden. Can be used directly on a flame to cook. Earth green color design. 7-1/4" in diameter #190950D ($40.95), for serving 1-2 people. 8-1/2" in diameter #190951D ($60.95), for serving 2-3 people. 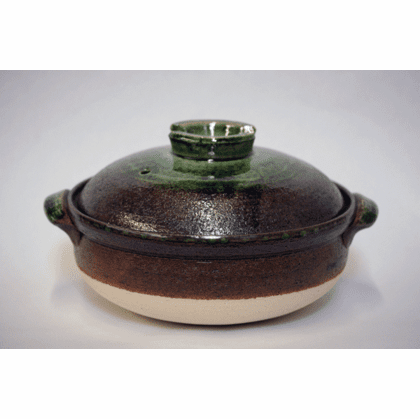 9-3/4" in diameter #190952D ($79.95), for serving 3-4 people. 10-3/4" in diameter #190953D ($90.95), for serving 4-5 people. 12" in diameter #190954D ($139.95), for serving 5-6 people.